Heads up, dog and animal lovers! You’ll definitely want to check out Colin Campbell’s charming memoir Free Days with George, about how his giant Newfoundland dog George changed his life. I’ve been wanting to read this ever since I heard about it at the Random House blogger preview, where to my relief, I also learned that unlike so many dog books, George does not die at the end and in fact will be accompanying the author on his book tour. Later on in the book, Campbell observes that he’d just spent a free day with his dog, and he didn’t quite realize it until that moment. Perhaps that’s another important aspect to note about free days as well — they kinda sneak up on you, and it’s only looking back when you realize how amazing an experience you’ve just had. Free days can sometimes be hard to come by, though. In Campbell’s case, his story with George begins when his wife leaves him for no discernible reason. He insists on couples therapy, but the truth is, she simply doesn’t want to be married, and there’s not much he can do about that. A friend suggests he gets a dog to help stave off the loneliness. 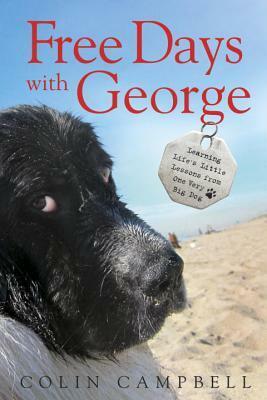 Enter George, a black and white 140 pound Newfoundland labrador with soft brown eyes and a deep-rooted mistrust of men. Campbell learns he may have been mistreated by former owners — likely men, as George has no problem warming up to women. Apparently, because Newfoundlands are such a large breed, many people want to train them to be guard dogs, not realizing that they are extremely gentle creatures. And once they learn that no amount of abuse will turn this type of dog vicious, they give them up to shelters. It’s a tragic situation, and it was almost painful to read Campbell’s first encounter with George — at the foster home, while all these other dogs frolicked and played with a little girl, George stood apart, alone, and watched. Because of George’s past experiences, he is naturally wary around men, and at first even refuses to eat in front of Campbell. I loved reading about him gradually opening up, and learning to trust again. I love how something as simple as a hug could have such an emotional impact on both dog and human. There’s also a really great scene at the dog training school, where the owners hide behind screens and their dogs have to find them. All the dogs in the class are having trouble with this exercise and, with George having the most trouble by far with the other lessons, Campbell isn’t too optimistic about his chances with this one. The way that scene turned out actually brought a happy tear to my eye, and is quite possibly my favourite moment in the entire book. The narrative momentum dips slightly in the second half. There are great scenes of George and Campbell surfing — yes, George can surf! — and it’s all very heartwarming, but the emotional intensity of their first few months together has definitely dialled down. And while the book ostensibly begins with the author’s need for emotional connection, and has some really strong, poignant memories of the author’s grandfather, the story ultimately doesn’t delve too deep into this beyond a few slogan-esque lines. I think a big part of that is we don’t get much of a sense of the author beyond his relationship with the dog. Getting the dog to trust him was a huge emotional surge that peaked much too soon, and the part about surfing competitions, while entertaining, never really built up any narrative tension. I love how the author at times linked his experiences with his dog to his memories of his grandfather, who clearly was a major influence in his life, and I wish there had been a lot more of that in the story. Still, this is a very charming read, and particularly if you’re a pet owner yourself or at least an animal lover, George’s story will certainly strike a chord. Read this book, and be sure to connect with George on Facebook or at www.freedayswithgeorge.com. Want to spend your own “free day” with George and Colin’s story? Enter this contest for a copy courtesy of Random House Canada! This entry was posted in Book Reviews and tagged 50BookPledge2015, Memoir, Non Fiction, Random House Canada by Jaclyn. Bookmark the permalink.